Continuing with its brand campaign #ISayYes, to engage and support aspirational youth of India, Datsun announced its association with Magic Bus for the Datsun Flagbearers campaign. The joint campaign will run throughout the ICC World Twenty20 2016 and enable almost 200 underprivileged children to walk hand-in-hand with cricketing legends on the field as flagbearers during the matches. With team India’s first match in ICC WT20 series from Nagpur today, children wished their favourite team and crickting legends, luck for the series. 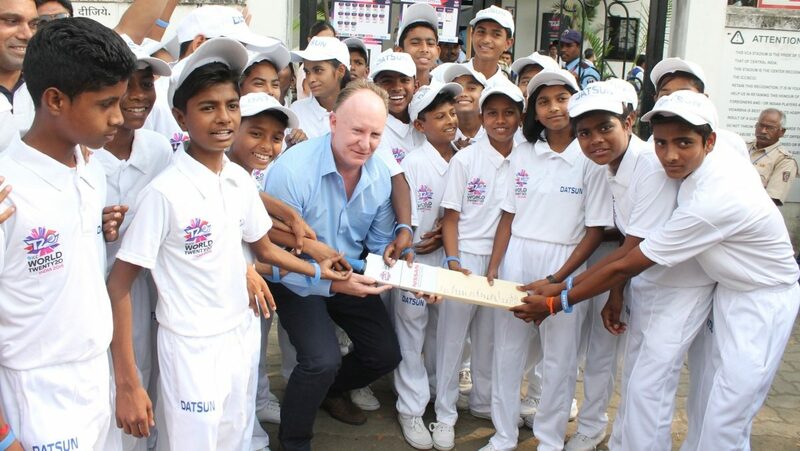 The wishes were written on a cricket bat and presented to Mr. Campbell Jamieson, General Manager, ICC. The children were from Chandrapur and are part of Datsun Flagbearers programme. Datsun Flagbearers campaign officially commenced from March 8, with the first league match of ICC WT20 in Nagpur. It will cover all matches across eight cities including Bangalore, Delhi, Dharamshala, Mohali, Kolkata, Mumbai and Nagpur, giving selected children an unexpected access to the world of cricket. Twenty-six underprivileged children associated with Magic Bus from each city will proudly bear the flags in the grounds at the start of every match, along with the players. The ICC World Twenty20 2016 is the first major event following Nissan’s announcement of its eight year partnership with the International Cricket Council (ICC). The partnership is a step towards bringing the game closer to the Indian audience and Datsun Flagbearers campaign offers a chance for young cricket fansto be a part of the excitement. Magic Bus, a 17-year-old child and youth development organization, works with 400,000 children from some of India’s poorest areas to equip them with education and take them on a journey towards better livelihoods as adults. Datsun’s association with Magic Bus is aimed at helping children with an #ISayYes attitude to realise their dreams.